For a contemporary spin on more classic thank you card designs, our Delicate Destiny thank you cards offer a colorful, but classic, touch. Floral scrolls and curls adorn both corners for an elegant look, while your customized wedding font presents your message front and center. The design features a vibrant coral pink color scheme, making it fitting for spring weddings, or coral pink themed weddings. 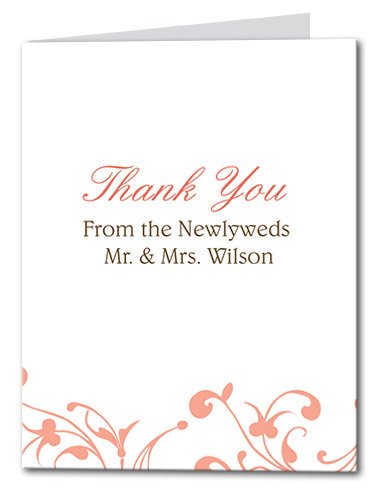 Delicate Destiny Thank You Card For the best experience, we recommend personalizing your stationery on a desktop computer.